They came originally because Kevin Riley didn’t fancy Rockingham. 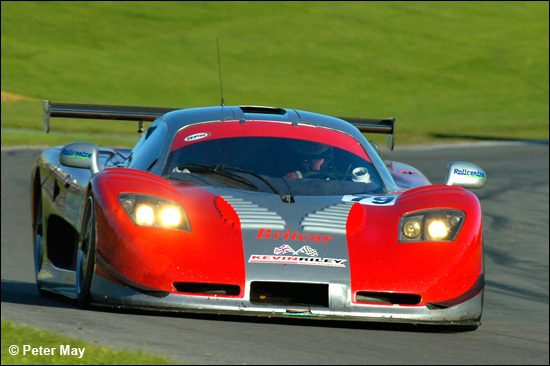 Instead of running the Rollcentre Mosler MT900R in the early-August British GT race at the Corby track, Riley and Ian Flux did the Britcar race at Donington, posting the overall win. A second victory, back at Donington a fortnight ago, in the Britcar Open, was complemented by another win at Brands Hatch on Saturday, in the two-hour Open race. Statistics show that they have dominated the late-season daylight races, but it hasn’t all been plain sailing. As at Donington, the “Open” race lived up to its name, attracting an eclectic bunch of GT cars – newcomers, those who had dipped in and out during the year, and just a few of the regulars. Qualifying was, initially, no real indicator of performance, the greasy track (the weather was perfect) throwing tyre choice and driver skill into the equation, with horsepower. All three of those elements added up to a Rollcentre pole, Flux and Riley needing just 20 laps to secure the front row slot at 48.254. 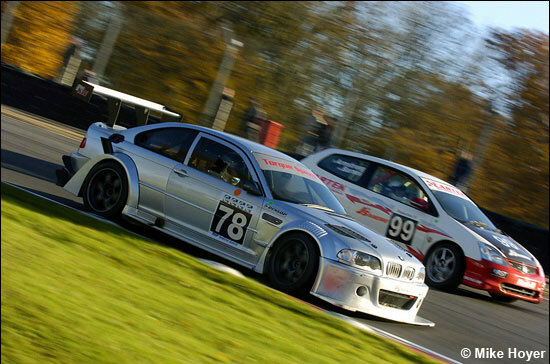 Alongside them was the BMW M3 GTR of Peter Seldon and Eugene O’Brien, half a second shy, after an overnight rebuild of a complete front corner, owing to a major off in Friday testing, caused by a locked differential. 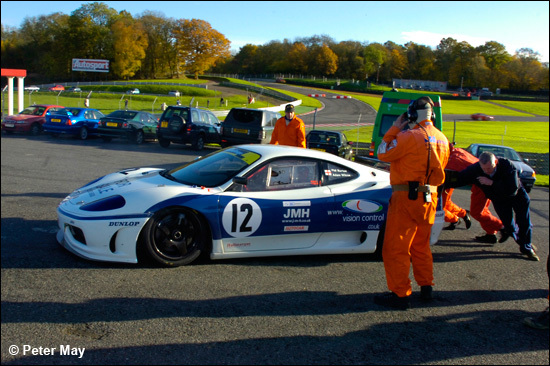 Phil Burton and Adam Wilcox posted third in the last race – definitely – for the JMH Ferarri 360, with the Trackspeed Porsche 996 of Fred Moss and the colourful David Ashburn – a contender for pole early in the session – fourth. 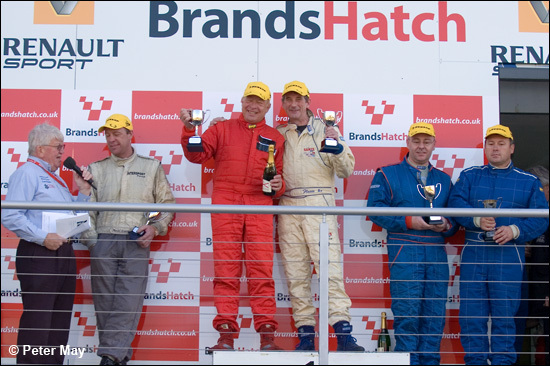 The ex-Bo McCormick Ferrari 360, now in the hands of Shiltech, and driven in the daylight race by David Foster and Andy Ruhan, was fifth, followed by the brand new Chad Racing Porsche 997 of Nigel Greensall and Iain Dockerill, sixth. 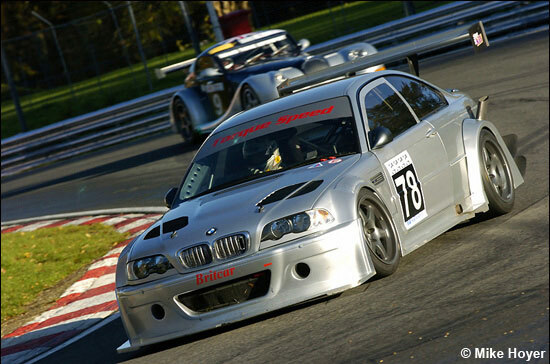 Kevin Clarke headed the fourth row, in only the second run in his week-old BMW M3 GTR. He had qualified the self-built car fourth overall at Vallelunga a week earlier, the first time the machine had turned a wheel, though shake-down niggles saw him finish 14th at the Italian track. 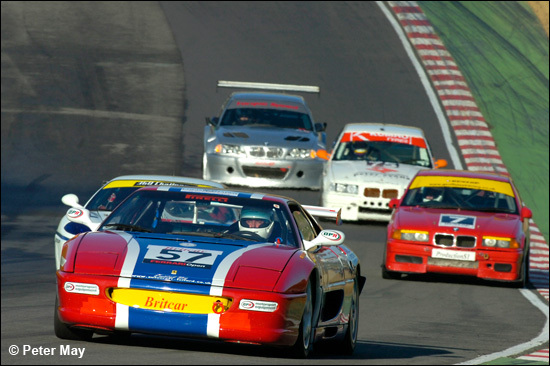 The leading ProductionS1 runner was eighth on the grid, the amazing Class 2 Metcalf Motorsport BMW E30 of old hands Mark Smith and David Cuff, then the GTC class Topcats Marcos Mantis of Jon Harrison and Richard Gomes. 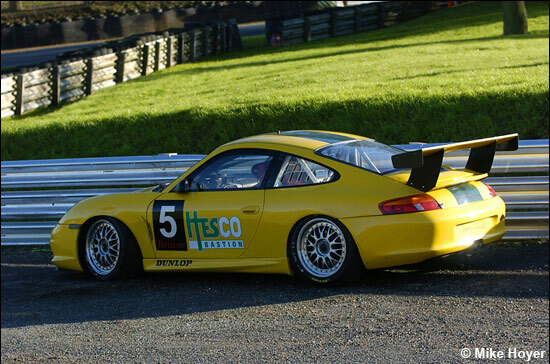 The top ten was rounded-off by the leading Class 1 car, the Geoff Steel Racing BMW M3 of Michael Symons and Andre D’Cruze. “We had engine problems in testing yesterday, and the team worked through the night, until six am, to fix it,” said Andre. 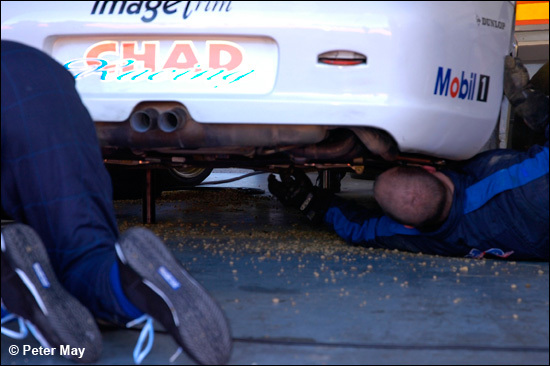 That quote was at nine o’clock on Saturday morning, and Geoff and his hard-working lads were hard at it again, prepping their two cars for qualifying. Britcar runners a little further back than they would have liked were the Jemco Marcos Mantis of Kevin Hancock and Leigh Smart, 20th overall, and, one place further back, the Richard Thorne Morgan Aero 8, in the hands of Max Wakefield and Hugh Angle. And so the race. 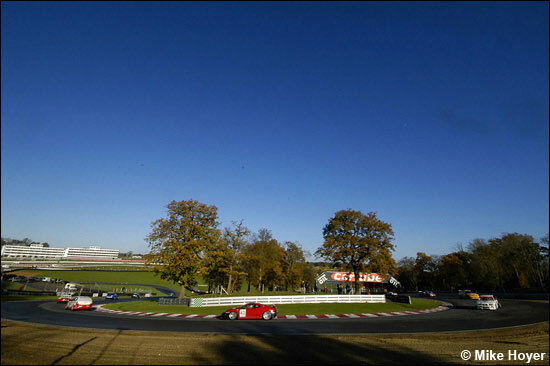 By popular request, to ensure reasonable tyre heat over the short lap and in autumnal (chilly) conditions, Clerk-of-the-Course Derek Stanley had agreed to two pace laps before the green light, although, in the interests of time-saving, the clock would start ticking after the first pace lap. Thus, with one lap already on the board, the field was let loose, Riley taking the Mosler into the lead from pole, ahead of a fast-starting Ashburn in the yellow Trackspeed Porsche. Ashburn was maybe a little too fast-starting, for an excursion onto the grass at Graham Hill Bend dropped him to fifth. A similar fate befell Michael Symons’ BMW, relegating him to the back end of the 27-car field. 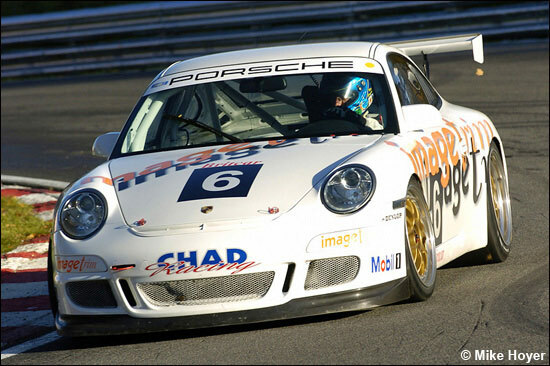 Ashburn lost no time in climbing back, dispensing with Burton’s Ferrari for fourth, whilst at the sharp end, Riley held a lead of less than a second over a squabbling Seldon and Greensall, in the Chad Porsche 997. 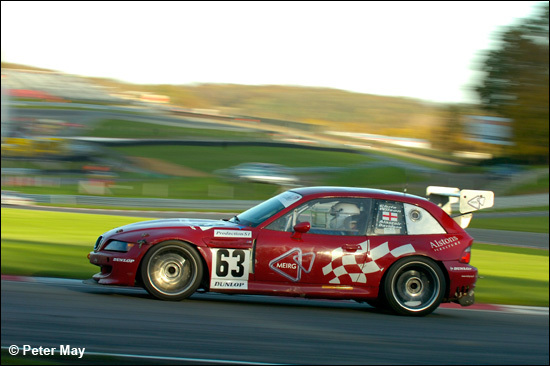 The blue BMW GTR was smoking heavily in the right-handers at Druids and Clearways, however, and, 14 laps in, Seldon brought the car in, for what would be its retirement. “It’s a serious oil leak, probably an effect of Friday’s shunt, which damaged an engine mount”, explained Eugene O’Brien. The ProductionS1 lead at this stage was being disputed by two Class 2 runners: Mark Lemmer, eighth overall in the Barwell Honda Integra, was just keeping ahead of Mark Smith’s BMW E30. A spin by Riley at Clarke Curve allowed Greensall into the lead, with Ashburn in tow, leaving the Mosler third, in front of the JMH Ferrari, which was now being threatened by Kevin Clarke’s BMW GTR. 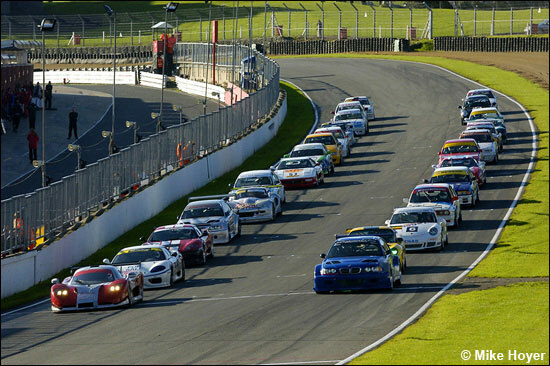 Twenty-seven cars of disparate performance can lead to frantic action on the short Brands Hatch Indy circuit, and with a quarter of the two-hour race run, some of the ProductionS1 cars had already been lapped several times by the GT3 leaders, and the gap between Greensall in the lead, and Ashburn behind, fluctuated as they hit traffic. Ashburn made the most of a clear piece of track, and latched on to Greensall’s tail, harrowing him menacingly into Paddock, Druids, and Clearways, and often getting a nose down the inside. Clearly, something had to give, and, with 54 laps chalked up, a move by Ashburn at Paddock saw the pair come to grief, the Chad 997 ending up in the gravel, and the Trackspeed 996 coming to a rest on the infield further down the hill. Just before this, Phil Burton had brought the JMH Ferrari into the pits through the back door, retiring with driveshaft problems, and now, the Safety Car was deployed to clear-up the erstwhile leaders’ accident. With 70 minutes left to race, and just before the halfway mark, this would be an opportune time for a mandatory pit stop, and Kevin Clarke, driving alone in the GTR, was the first to take the initiative. 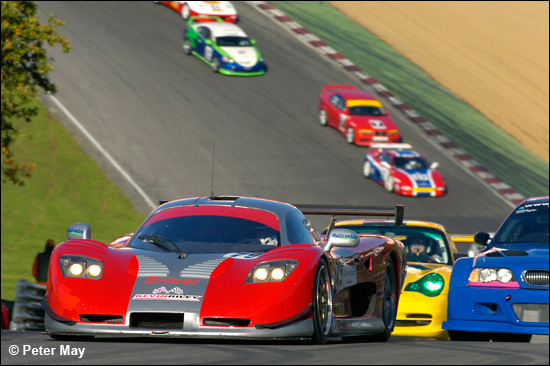 An initiative, strangely, seized by more of the ProductionS1 teams than the Britcar front-runners, and a combination of retirements and out-of–synch pitting now saw Riley’s Mosler back in the lead, followed by Richard Gomes 22-seconds back in the Topcats Mantis, then the similar Jemco car of Kevin Hancock. 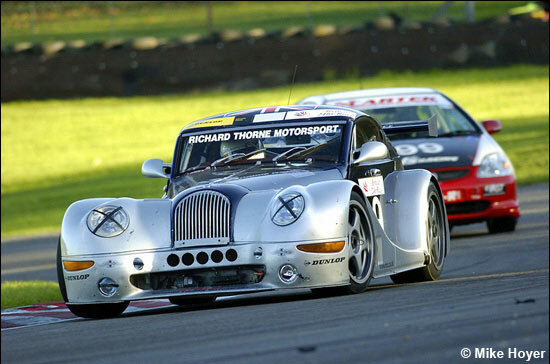 Clarke had timed his stop right, and held fourth, ahead of Alastair Davidson’s BMW Z3 Coupe, which had been stealthily creeping up the order, and, by canny use of the safety car, now led the ProductionS1 field. “I saw the Molser behind with its lights on, so I moved over so that they could see it from the Safety car – and they promptly waved me past,” said a gleeful Davidson. The Safety Car came in, somewhat prematurely it would seem, after five laps, but was back out just half a lap later, picking up the field again as they came out of Graham Hill Bend - debris on the run-up to Druids given as the reason. Kevin Riley took advantage of this extended caution, pitting from the lead to hand over to Ian Flux. By now, at the halfway stage, all except Witt Gamski (below), running third overall in the Ferrari 355, and Neil Armstrong (Honda Civic) had made their stops. There was trouble for Topcats and Jemco at Clarke Curve, first Jon Harrison spinning his silver Mantis, then Leigh Smart going off in the green and black Jemco machine. “Somebody dropped some oil,” was Harrison’s rationale. Incidentally, Brands Hatch press room guru and amateur entymologist Colin Mann insists the plural of Mantis is “Mantids”, though the Collins English Dictionary confirms it as “Mantises” or “Mantes”, as it also confirms the correct spelling of entomologist. Jem Marsh insists that the plural of Mantis is Mantis. 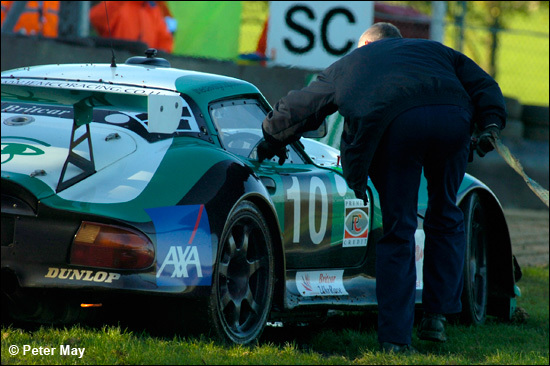 None of that is relevant to Phil Cutts, however, who also fell foul of this perceived slipperiness at Clarke Curve, and got going, slowly, again, but with the Jemco Marcos stuck, the Safety Car was brought out again. Just a couple of laps were all that was needed, and once the bunched-up pack was released again, there was more trouble for Harrison in the Mantis, as he clashed with Max Wakefield, who had taken over from Hugh Angle in the Richard Thorne Morgan. Andy Ruhan, in the Shiltech Ferrari 360, and Ed Pead’s Barwell Honda, were following very closely, and had to take dramatic avoiding action onto the grass at Graham Hill Bend. Harrison continued, though the Morgan pitted briefly, the rest of the race leaving Wakefield with acute and protracted handling problems – because one-third of his tread on the left front had vanished. With Flux now in a convincing lead, a lap ahead of Clarke’s GTR, and fastest lap of 47.850 in the bag, it seemed like a steady run to the flag. Or maybe not. David Cuff came to a rest in the refuge point just before the pit exit, the merest hint of smoke before he quickly shut-off the engine signifying a problem with the Metcalf BMW E30, and Jon Harrison’s recovery drive saw him take Pead’s Honda for fourth overall. 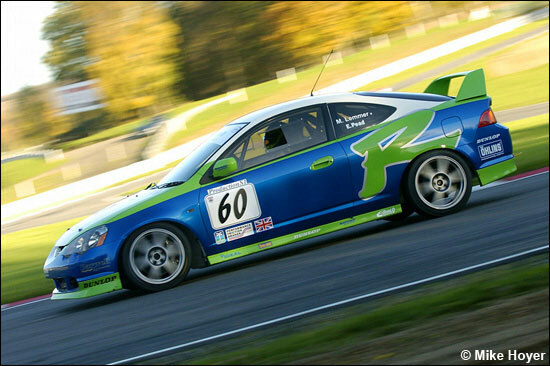 Pead had earlier shaken off the threat of Andre D’Cruze’s BMW M3, which was now encountering engine management problems. The unusual little Opel Belmont, run by GTS Motorsport, had a fascinating history, but Andy Wolfe brought it in to retire after 95 laps with suspension failure. The car, unused by Philip Walker since the 1999 Nurburgring 24 hours, had been a class winner in the 1993 edition of the race, with the Strycek Opel works team. So, that steady run to the flag, then. The “last lap” board was shown, and as Fluxie came down from Druids for the last time, the Mosler slowed dramatically, allowing Kevin Clarke to claim his lap back. A spurt, then weaving from side-to-side round clearways indicated the Mosler was running out of fuel, and it cruised across the line to take the chequered flag. “The meter was showing 10 litres of fuel left three laps from the end, then all of a sudden it changed to two litres,” said Flux after the race. And that earlier spin? “I thought I felt a fuel pick-up problem, so I gave it a bit too much throttle,” admitted Riley. 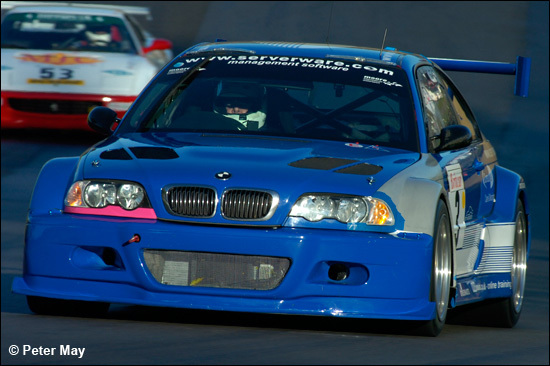 Kevin Clarke was an impressive second overall in the new BMW GTR, taking the GT Cup class win in the process. A sensational third overall, in only its second outing this season, was the BMW Z3 “breadvan” of Alastair Davidson and Chris Wilson, five laps down, but taking the ProductionS1 and Class 1 honours. “I let things settle at the start, let everybody sort themselves out, then picked my way through. When the safety car came out, I ignored the pit boards telling me to come in, positioned myself right, then got waved past. I made-up a lap on the others there, but we were also consistent too – neither of us did a lap under 55 seconds,” said a delighted Davidson. 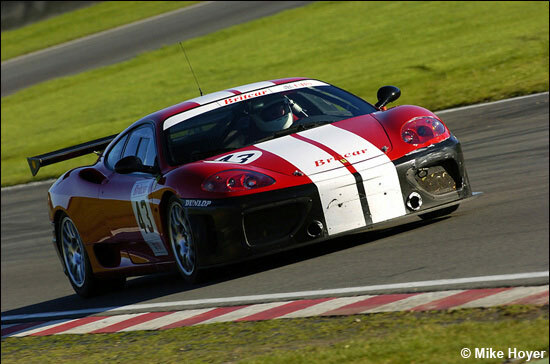 The Shiltech Ferrari 360, driven by David Foster and Andy Ruhan, under the watchful eye of Aron Scott, won the GT3 class, coming home seventh overall.